Under proposal by state Rep. Mike Noel, R-Kanab, Salt Lake City and other large municipalities could lose their regulatory reach over mountain watersheds outside their boundaries. 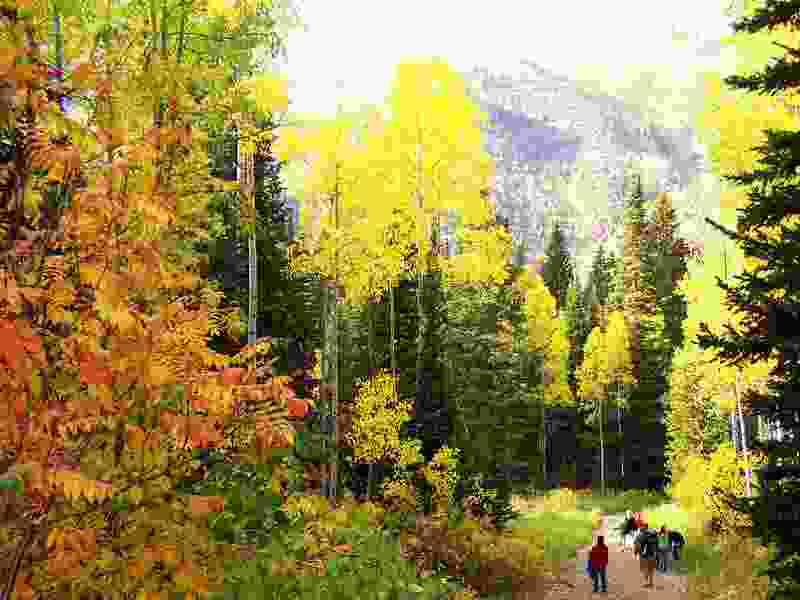 Erin Alberty|The Salt Lake Tribune (Erin Alberty| Tribune file photo) Fall colors catch the afternoon sun on the Doughnut Falls trail in Big Cottonwood Canyon, where Salt Lake City draws some of its water supply for residents and businesses. New legislation would strip Utah cities of a regulatory tool that has long let them protect their distant water sources from pollution associated with building and animals. The longstanding ability of Utah cities to regulate land use in mountain watersheds they tap for drinking water could come to an end, under a bill filed in advance of this year’s session of the Utah Legislature. Rep. Mike Noel’s House Bill 135 targets a legal concept that dates back to Utah’s settlement era, enabling Salt Lake City to restrict dogs and livestock and some land-disturbing activities far up the Wasatch canyons that supply water to residents and businesses along the Salt Lake Valley’s east side. Cities’ so-called “extraterritorial jurisdiction” to regulate land-use outside their boundaries has long been a sore point for several property owners in Little and Big Cottonwood canyons, but Noel’s proposed fix could create more problems than it solves, according to some of the state’s top environmental regulators. Speaking at Tuesday’s Executive Water Task Force meeting, officials with the Department of Environmental Quality said HB135 shifts the burden of ensuring drinking water standards from cities to the DEQ, which is not equipped for the task. Noel, a Kanab rancher who runs a water district, did not respond to several interview requests sent via phone, text and email. In past meetings, Noel has complained that Salt Lake City has exercised its authority in ways that thwart development to the detriment of private property rights, particularly in Big Cottonwood Canyon’s Cardiff Fork. Several Cottonwood land owners have brought their concerns to the Legislature’s Commission for the Stewardship of Pubic Lands, seeking relief from rules imposed by a distant city. The 2018 legislative session convenes Jan. 22. Property-rights advocates object because the rules mean Salt Lake City leaders can enact and enforce restrictions on land owners who have no recourse at the ballot box. The public-lands stewardship commission had directed the Utah Quality Growth Commission to study the issue and provide recommendations. But that group, co-chaired by Salt Lake City council member Erin Mendenhall, concluded it lacked expertise to comment. The panel urged the Legislature to review extraterritorial jurisdiction and consider offering financial relief to property owners who have not be able to develop within restricted watersheds. Noel, however, didn’t wait for that review before filing his bill. His proposal would revoke cities’ jurisdiction outside their boundaries and authorize the DEQ, working with local health departments, to set up water standards protective of human health and for construction and operation of city waterworks. His bill would also require cities exceeding 100,000 residents to provide a “highway” for driving cattle, as well as sheep, hogs and horses through town. No mention of goats or llamas, but that last provision had water task force members scratching their heads since there is little if any grazing on the lands outside the six affected cities, all clustered along the Wasatch Front. Noel did not attend the meeting, although his bill was a key part of the agenda. A supporter of Noel’s bill, former Salt Lake County mayoral candidate Dave Robinson, said the city 1991 watershed ordinance is redundant since the canyon watersheds are protected by federal, state and county rules. DEQ director Alan Matheson said his agency was not consulted about the proposal, which he read for the first time this week. But DEQ division directors were worried about stripping the tools Utah cities need to meet federally-set drinking water standards. “Striking this language impacts every single municipality, not just Salt Lake City. We’ve got significant amounts of surface water generated outside of the jurisdiction boundaries,” said Marie Owens of the state Division of Drinking Water. “Introducing this bill before consulting environmental agencies clearly indicates a disregard for environmental quality or the needs of the majority of Utahns, and instead highlights a desire to serve ranching, business, and development,” a news release from the group said. A lobbyist for Salt Lake City wondered whether the state would indemnify cities against all the lawsuits that might arise from the Noel’s bill if it becomes law. In an interview, Salt Lake City’s Public Utilities director Laura Briefer agreed Noel’s proposal was not well vetted and could be fraught with unintended consequences. “It creates a disconnect between the accountability and responsibility of the water supplier to the people we serve and puts it in another agency’s hands that doesn’t have that accountability,” Briefer said.